We are pleased to invite you all to our annual NJPAGS Internship Fair!! 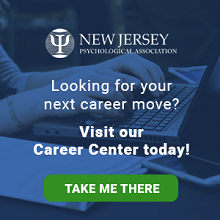 Each year the New Jersey Psychology Graduate Students (NJPAGS) sponsors an Internship Workshop and Fair that features a Q&A session with a distinguished panel of internship directors and a meet-and-greet with directors who are available to provide information about their sites. The purpose of the NJPAGS Internship Fair is to provide information and strategies about the internship application process. This is also a huge opportunity to network with internship directors who you may end up seeing at your interviews!!! Dennis Finger, EdD will be providing a CV, cover letter, Interview Workshop. Visitors may park in Lots 54 & 51B without permits. Guests must use the below link to register for the event. Until this process is completed their vehicles are not registered and your guests may receive a citation. Special event parking and special event permits are only for visitors to the University which does not include free metered parking. Faculty, Staff, and Students must park only in lots they are authorized to park in. If you have a question regarding a special event, please email it to [email protected] to ensure a timely response. Register for parking here. To RSVP, please email Christopher Thompson ([email protected]) or Chelsea Torres ([email protected]). - To establish and maintain channels of communication between NJPA and schools, universities, training centers, institutions, and other members of the psychological community. - To support NJPA, by creating a leadership pipeline, enhancing the visibility of the association within the academic community, adding valuable input from the student perspective, and helping to populate committees and special interest groups. NJPAGS is designed to give students a stronger voice within NJPA and advocate for student issues. NJPAGS provides opportunities for student leadership development and facilitates dialogue between NJPAGS members and members of the professional community. NJPAGS declares its intention to raise the consciousness of its members about issues of diversity. These issues include, but are not limited to race, ethnicity, gender, age, socio-economic status, sexual orientation, religion, disability, country of origin, and marital status. NJPAGS is committed to addressing these issues and concerns in its programs and publications, as well as in their professional interactions. Becoming a member of NJPAGS means keeping informed about the issues affecting the practice of psychology in New Jersey. It is a unique opportunity to network with local peers, and enjoy each others' support in addressing the challenges associated with graduate study in psychology. It gives students a chance to network with local professional psychologists and learn from their knowledge and experience. The 2018 Internship Fair was held on June 8, 2018 at Rutgers University; Life Sciences Building Atrium. The event, hosted by NJPAGS, offered graduate students a step-by-step guidance workshop on landing the right internship, including tips, strategies, and a Q&A discussion with a distinguished panel of professionals. Look for details of the 2019 Internship Fair early next year! The New Jersey Psychological Association’s Division of Academic & Scientific Affairs recognizes the accomplishments and scholarly contributions of students and colleagues at our annual Fall Conference. Self-nominations are encouraged and nominees need not be members of NJPA. The Committee on Academic and Scientific Affairs reserves the right to make all final determinations on which awardees will be selected. Learn more here.